Motormouth On Being Home, Feeling ‘Naked’ & Curry Mee for Breakfast! Dry Curry Hor Fun @ Sun Heng Coffee Shop, Canning Garden, Ipoh; served with a generous handful of bean sprouts (Ipoh’s tauge, not dehydrated/miniature ones), slices of barbecued pork, roasted pork and poached chicken slices. Home sweet home again. After being literally stranded on the expressway for a good 4 hours northbound, I woke up to chirpy birds, sunny skies and greeted by my very loving Golden Retriever. The sun borders on being relentless this morning, maybe challenging this seemingly-unshakeable will to go round town and venture on a food-hunting spree. However, as fate would have its way, in the midst of basking in the glory and euphoria of an extended weekend (it’s Malaysia Day the coming Monday), Motormouth left his trusted camera behind. So much for a gastronomic journey back home. Dear readers, please bear with the shots taken with my phone (it’s been a good four years since I last used my phone for food shots; remember circa 2008-2009 when the Nokia 5610 was the only ‘gear’ that I had?). 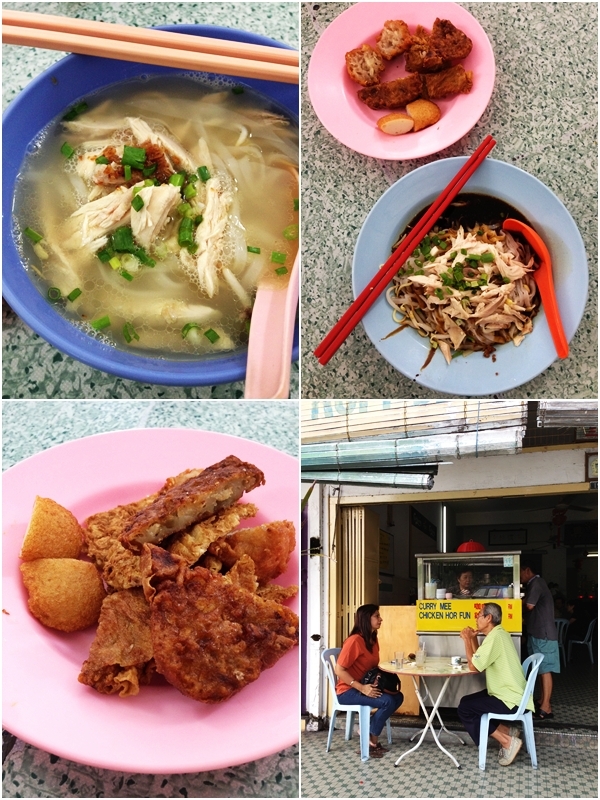 Let’s start the series with a neighbourhood favourite curry mee stall in Canning Garden. Stepping in into Sun Heng coffee shop facing the Canning Garden wet market, you can’t help but feel transported to few decades away. 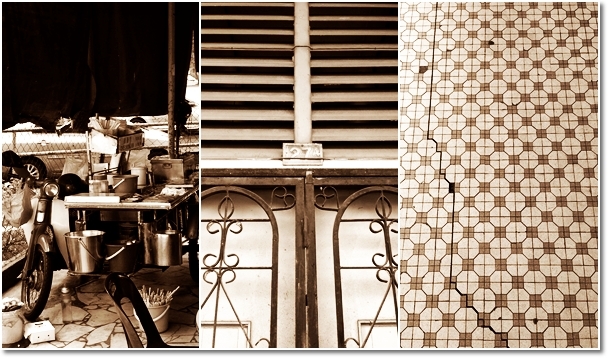 The window panes, stark white walls with dated pictures of horses and jockeys, mosaic-tiled floors and old ceiling fans. The barely 5 hours of sleep yesterday night exerted its impact on this aging frame of Motormouth’s, so I decided on settling for something simpler; a plate of dry curry noodles in Canning Garden. 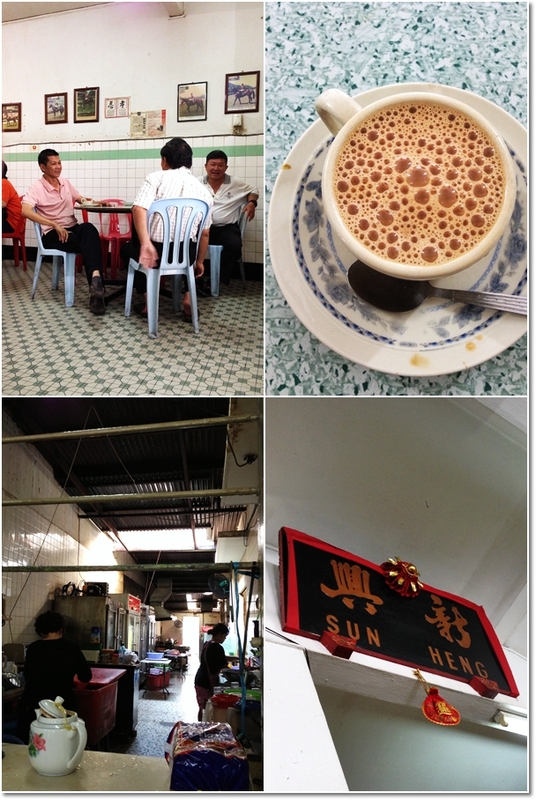 Sun Heng coffee shop resembles Sun Up very much; almost an exact replica. 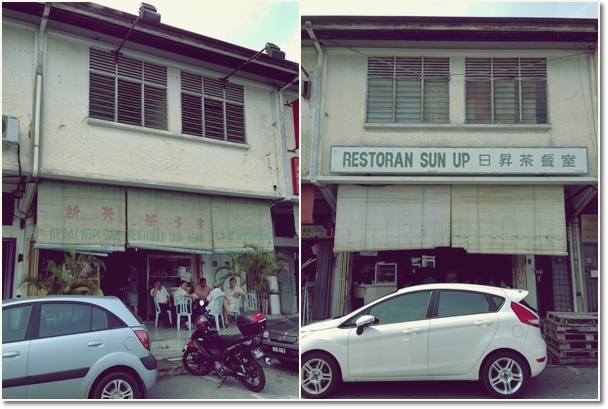 Sun Up is famous for their beef noodles and Western breakfast fares (a firm favourite of ours back in our secondary school days), and in between the two coffee shops was of course, the iconic shop lot where Indulgence first started. The breakfast crowd here is not something you should take lightly of. Not hard to see why, since in this neighbourhood resides a sizeable Chinese community, and the wet market operates directly across the small road. Thankfully, the hawkers here (family-run business, I presume) are relatively genuine and nice people. Even to the point of thanking me after the meal, and apologizing for the wait. Which was barely 15 minutes to begin with. Anyway, the dry curry mee here deserves a mention purely for the freshness of the ingredients and quality of the smooth, rice noodles used. A notch below some of the better ones in town (try browsing through this post), yet one that I don’t have second thoughts coming back on lazy Sunday mornings when venturing to town is almost out of the question. The fried items (yong tau foo, or yong liew) were passable, and being mere sides, not something you should shoot yourself in the foot in case you have missed them. Worth mentioning was the fried balls (zhar yuen), something that Kampar noodle stalls do so well yet hard to replicate elsewhere. Sun Heng’s on the left (curry noodles) and Sun Up (beef noodles) on the right. 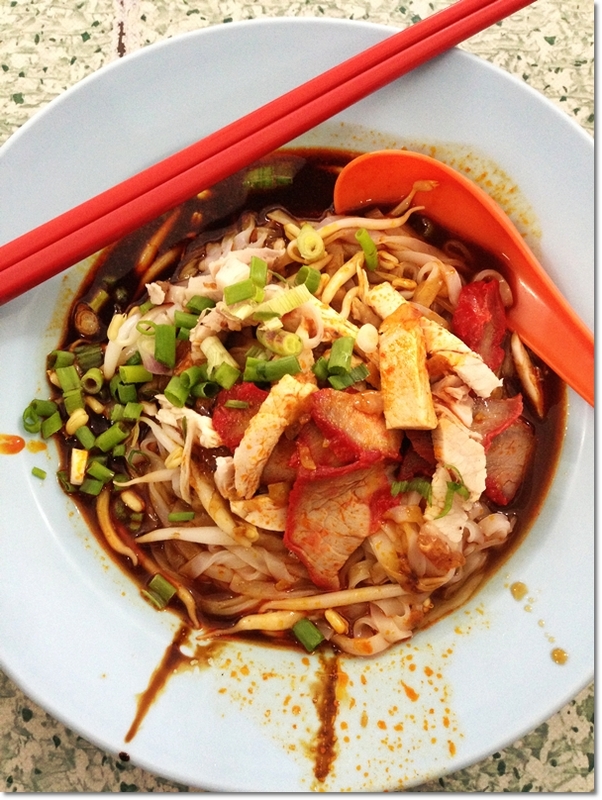 The curry mee stall opens for breakfast until lunch only. Directly facing the Canning Garden wet market, and same row as the famous Canning Garden chee cheong fun stall. *All pictures in this post were taken with iPhone 5. I left my DSLR in KL, thus the “naked” portion in the title. Nothing explicit, so no worries.